Malware Minute: What's in the box? Malware Minute: What’s in the box? The good news for Detective Mills is “not her pretty head”. The bad news for Detective Mills is “some rogue AV”. It seems poor old Mr Pitt can’t catch a break, because if he isn’t dealing with serial killers doing amusing and inventive things with deadly sins he has websites like The Brad Pitt Fanclub (bradpittfanclub(dot)org/tmp/go(dot)php) directing users to rogue AV installs – and a box, which is as tenuous an excuse as I need to start making wise with the Se7en cracks. At this point you’ll be offered the box download (well, it looks a bit like a crate but whatever, it’s a box) and opening it up will kickstart an install procedure laced with, oh, at least twenty deadly sins. Your final destination is “Windows Troubles Solver”, which is not only a name filled with humorous lies but also a horrible piece of rogue AV which you really should remove as soon as possible. Current VirusTotal scores are 13/42, and we detect this as FraudTool.Win32.PrivacyCenter.ek!a (v). As a bonus, here’s an interesting Kevin Spacey Se7en factoid. This post is shared with permission from GFI Vipre. 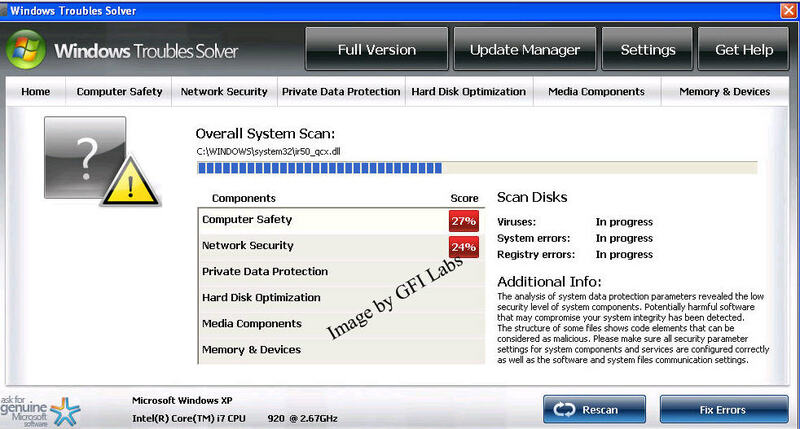 Malware Minute GFI Vipre, malware, spyware, virus. permalink.